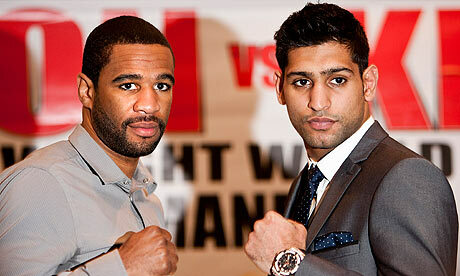 Lamont Peterson, left, with Britain’s Amir Khan. After their 2011 fight Peterson was found to have tested positive for steroids. Boxing has an almost insoluble dilemma. Suspicions have been rife for the past few years that several top-flight boxers use performance-enhancing drugs (a couple have even been caught, while others have proclaimed their innocence, in and out of court), but the cancellation of a major fight costs fighters and their connections - as well as promoters and their television backers - so many millions that there is little collective will for discovery. Outside the British Boxing Board of Control, there is limp top-down leadership, because the sport is appallingly regulated at international level, as well as in large swaths of its US financial heartland. In such a fetid environment, abuse is so much easier than in other sports. The use of banned substances in boxing is multi-purposed. Theyallow fighters to train harder, to recover more quickly from injury and to grow in strength a long way beyond their normal capacity. When Amir Khan, whose training regime is as punishing as any in boxing, was forced back time and again by Lamont Peterson in their fight in 2011, he was only partially satisfied when he learned later the American challenger had been using anabolic steroids. True to boxing’s script, Peterson is back in the sport after a brief punishment. Others caught in 2012, with various levels of different substances, performance-enhancing or recreational, include Antonio Tarver, Erik Morales (both now retired), Andre Berto and Julio CÃ©sar ChÃ¡vez Jr (both still active). These, though, are the unlucky few. And their punishment is inconsequential. So, the curse lingers, and clean fighters are endangered by cheats.